Black mountain native cheryl edwards grew up admiring the expansive beauty of the Swannanoa Valley. Now, thanks to a guided-hike program hosted by the Swannanoa Valley Museum, she’s experienced it from an encompassing perspective, and has a passport to prove it. For the second year, the museum is offering a series of monthly hikes around the Swannanoa Rim. The 31-mile excursion, broken into 11 segments, takes participants to see waterfalls, historic railroad beds, and sweeping vistas. 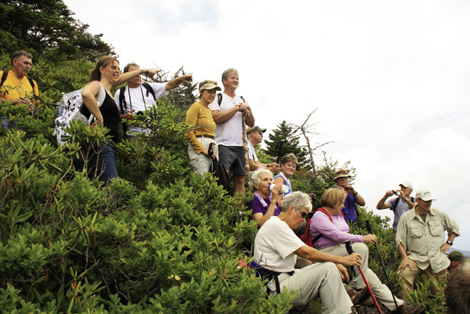 Experienced guides lead each trek—most between three and six miles—and discuss the history and topography of the land. Hikes are scheduled for the third Saturday of each month and are limited to 30 people. Explorers are issued a “Passport to the Swannanoa Rim” on their first hike, which is validated after the completion of each segment. And each stamp is a reminder of both the accomplishment and the journey.